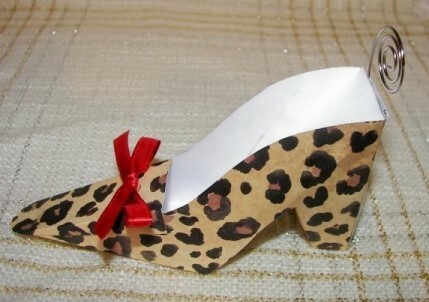 Designed especially for Diva Entertains, our leopard shoe place card holders are fabulous! Each shoe is handcrafted and you choose the color of the bow that adorns each shoe. Perfect card holders for a Leopard Print Wedding or Bridal Shower or a Leopard Print Baby Shower. 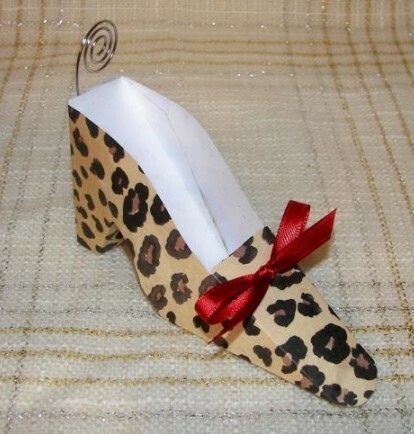 Each leopard shoe measures 2 1/4" tall and 4 1/2" long and is made from sturdy cardstock. The wire place card holder coming out of the back adds additional height. They are made of card stock and are sturdy (not flimsy at all). They are sure to 'wow' your guests!